Register your snow plow. By registering your plow, you create a record of ownership with the company, should your plow be stolen. Engrave the serial number in a secret location. By doing this you almost guarantee that a potential thief cannot tamper with it. This way, when you report your plow stolen, you can disclose to the police where the secret serial number is and ownership can be confirmed. A good place for it would be on the inside of the hydraulic compartment. Keep your snow plow on your truck. Don’t take your plow off your truck if you don’t have to.A plow mounted on your truck is one of the safest places for it to be during the plowing season. Store your snow plow in a secure, well-lit area. Store your plow in a building that you can lock and has sufficient lighting for when you’re there and away. For extra measure, an outside motion light could help discourage potential thieves. 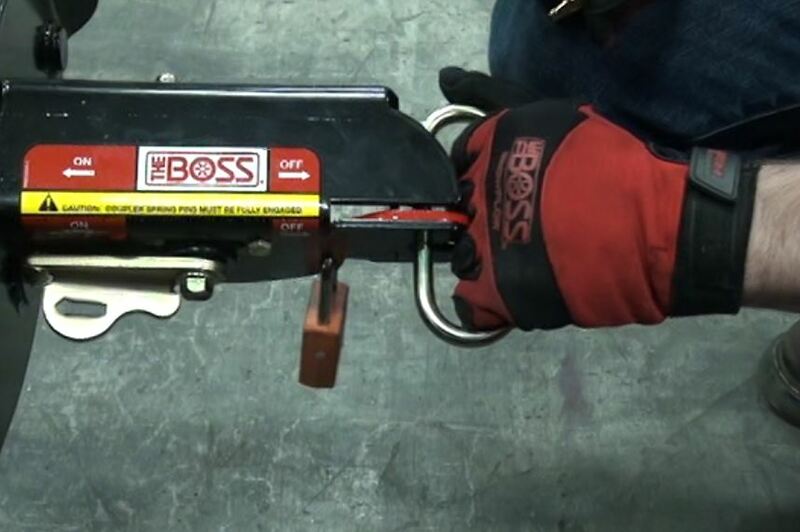 Put pad locks on your coupler. There are two different ways you can secure your plow with a pad lock. During the months that your snowplow is not mounted on your truck, you can disengage the pins in your coupler system and slide pad locks through the holes where the pins would normally go. This will prevent the pins from sliding through and attaching to anyone else’s truck. While mounted, if you want to prevent anyone from removing your plow from your truck, make sure the pins that connect to your truck are engaged and locked in position. Then simply position the padlock in the hole between your plow and the locking latch that goes over the handle controlling the pins. Now, no one can unclip your plow from your truck. This method will also work while your plow is not mounted. Chain and Pad Lock. Of course, you can always go with the tried and true method of using a chain and pad lock and securing your plow to a pole. No one wants to wake up one morning and see that the spot where their plow used to be is now vacant. By taking some of these precautionary measures, you can greatly reduce the chances of your plow being stolen. By registering and engraving the serial number on your plow you can increase the likelihood of getting your snowplow returned, should it be stolen.